It’s never been more apparent that dollars invested in the development of employees and a positive company culture pay off big for companies, large and small. Indeed, smart entrepreneurs know that engaged employees are their company’s most important asset. Yet, human capital is not represented on the balance sheet. In fact, employees aren’t technically assets at all. Rather, dollars expended for salaries, benefits, employee development, etc. are simply considered a necessary expense. “Traditional methods of accounting don’t appreciate (pun intended) expenditures on our workforce as necessary contributions to creating and sustaining value in our businesses,” says Laura Queen, Founder and CEO of the human capital advisory firm, 29Bison. A ridiculous reality, given today’s evidence of the impact of an ongoing investment in a company’s workforce. Actions such as professional and personal development, retaining and promoting talent, improving the employees’ work experience, and fostering greater levels of trust and transparency can all be linked to tangible economic impacts. Leaders are calling for a change to recognize the return on investment in human capital. Blackrock CEO, Larry Fink, took a strong position in his 2018 Letter to CEO’sto champion the idea that people and profits go hand-in-hand. No doubt, a growing number of today’s leaders agree with Fink’s stance. “Our financial reporting and traditional economic calculus need to catch up to this mindset,” says Queen. As such, she is taking a rather creative step to generate more awareness around the topic. Leading a collaborative effort beginning in the Philadelphia area, Queen has brought together a diverse group of professionals to bring these ideas and financial formulas to life. Experts in the areas of human capital, finance, and valuation, have partnered with business-minded artists to produce a unique event in form of a live play. The play, inspired by author Dave Bookbinder’s The New ROI: Return on Individuals, demonstrates that the key to generating substantial and sustainable increases in the value of your business lies in the intangible assets. In other words, the human capital that is not even reflected on your balance sheet. Whether or not your accountant struggles with where to put this asset on your financial reporting, Queen offers these suggestions to begin this shift in your company. It’s certain to be reflected on the bottom-line. Establish, measure, and manage a set of human capital metrics that align with your organization’s unique objectives. Partner with accountants and advisors to build a comprehensive framework for metrics reporting. 2. Be intentional about the culture you’d like to create. 3. Be clear and communicate. Set clear expectations and measures of success and tie them to each employee’s performance objectives. Frequently remind everyone of what you expect of them. Develop strong relationships with your employees. Ask about what interests and inspires them. Know when they do their best work, and where they are interested in taking their careers. 5. Build trust and be transparent. Step into difficult conversations, be honest and forthright with each other, hold each other accountable, and invite feedback so you can both grow. 6. Invest in your people. Find ways to build their confidence and give them the tools to learn skills for the next evolution of your business and their careers. 7. Create a Succession Plan. A succession plan helps with a smoother transition when employees at all levels resign or leave the company for any reason. Identify and develop future leaders at your company to prepare for all contingencies. A succession planning process can also help you to identify gaps and weaknesses within the company, so you know where to focus your future recruitment efforts. No matter what your balance sheet says, continued investment in your employees will always pay off. Engaged, happy, loyal employees do better work. It’s as simple as that. In April of this year, I wrote an article discussing the 10 reasons the bull market had ended. Trump: Hey, Steve. This market is bad. I mean it’s really bad… really bad. You need to do something to make it go up. I mean really go up. Mnuchin: No problem. I’ll just call my buddies and tell them they need to start buying. You know, we can always hit up the “Plunge Protection Team” if we need too. Trump: The what? Oh yeah… I’ve heard of those guys. Yeah, you do that. We need this market to go up really big. I mean really big. I got a whole big pile of s*** going on here, my ratings are down, and I need the market to go up. I mean go up a lot. You make that happen, okay. Cuz that a**hole Powell ain’t helpin’ me one bit. Mnuchin: Check… I’m on it. 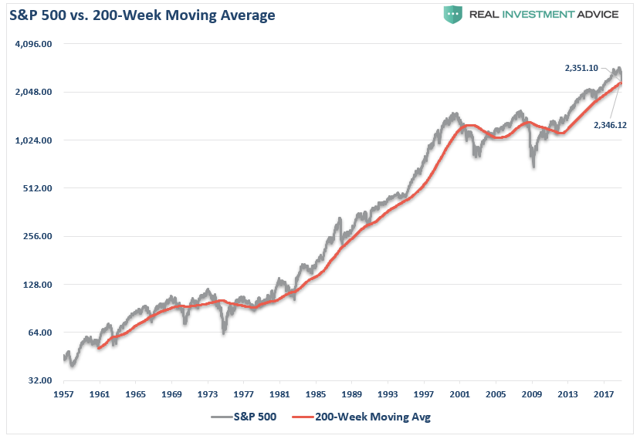 If we take a look back at the markets over the last 20 years, we find that our weekly composite technical gauge has only reached this level of an oversold condition only a few times during the time frame studied. Such oversold conditions have always resulted in at least a corrective bounce even within the context of a larger mean-reverting process. 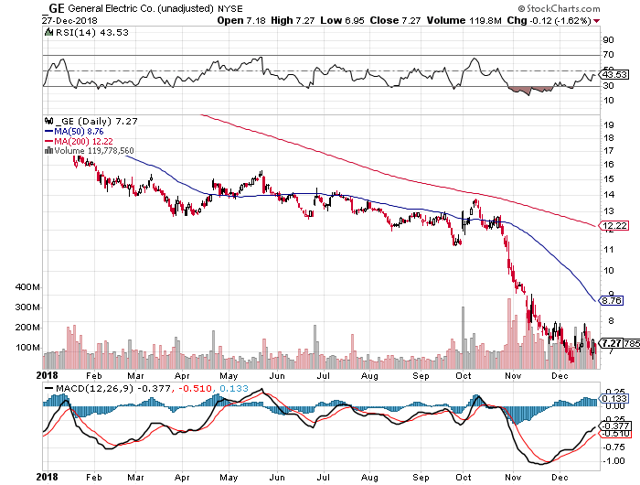 What this oversold condition implies is that “selling” may have temporarily exhausted itself. Like a raging fire, at some point the “fuel” is consumed and it burns itself out. In the market, it is much the same. While this is a true statement, it is incomplete. In bull markets, prices rise until “buyers” are unwilling to pay a higher price for assets. Likewise, in a bear market, prices will decline until “sellers” are no longer willing to sell at a lower price. It is always a question of price, otherwise, the market would be a flat line. Again, what the weekly composite indicator suggests is that “sellers” have likely exhausted themselves to the point that “buyers” are likely starting to outnumber “sellers” to the point that prices will rise, at least temporarily. 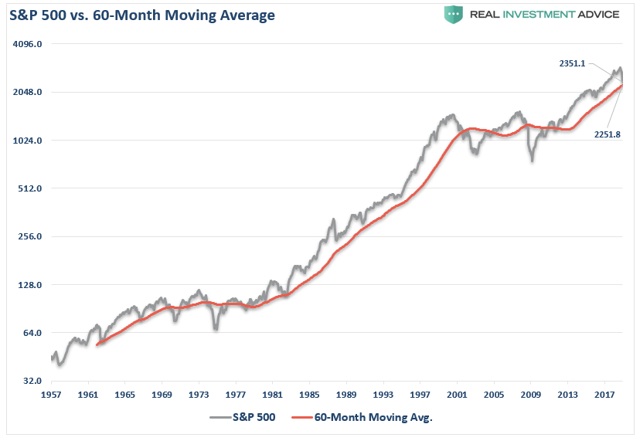 This also highlights the importance of long-term moving averages. Again, as noted above, given that prices rise and fall due to participant demand, long-term moving averages provide a good picture of where demand is likely to be found. When prices deviate too far above, or below, those long-term averages, prices have a history of reverting back to, or beyond, that mean. Currently, the market has started a mean reversion process back to the 200-week (4-year) moving average. As you will notice, with only a couple of exceptions, the 200-week moving average has acted as a long-term support line for the market. When the market has previously confirmed a break below the long-term average, more protracted mean-reverting events were already in process. Currently, the bulls remain in charge for the moment with the market sitting just a few points above the long-term average. A weekly close below 2,346 on the S&P 500 would suggest a deeper decline is in process. The same goes for the 60-month (5-year) moving average. With the market currently sitting just above the long-term trend support line, the “bull market” remains intact for now. Again, a monthly close below 2,251 would suggest a more protracted “bear” market is underway. 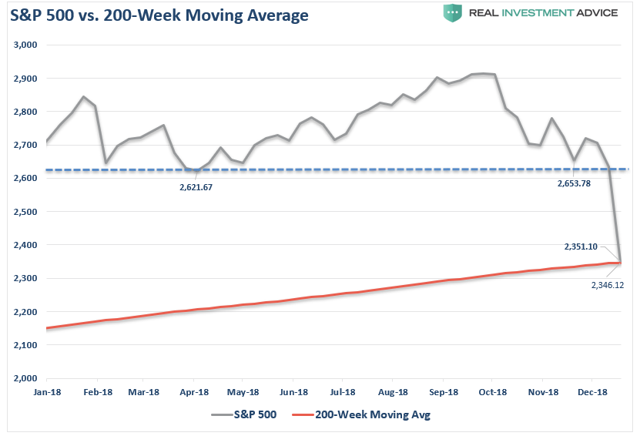 Looking at a chart of weekly closes, the most likely oversold retracement rally would push stocks back toward the previous 2018 closing lows of 2,620-2,650. On a monthly closing basis, however, that rally could extend as high as 2,700. From yesterday’s closing levels, that is a 12.7% to 14.8% rally. A rally of this magnitude will get the mainstream media very convinced the “bear market” is now over. Eventually, a bear market reveals those mistakes in the most brutal of fashions. It is often said the religion is found in “foxholes.” It is also found in bear markets where investors begin to “pray” for relief. Very likely, there are many investors who have learned of the mistakes they have made over the past several years. 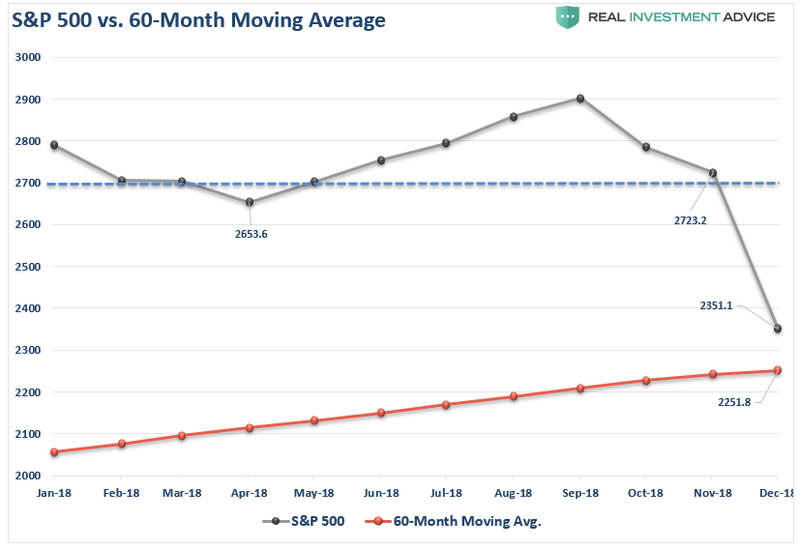 Therefore, any rally in the market over the next few weeks to a couple of months will likely be met with selling as investors look for an exit. 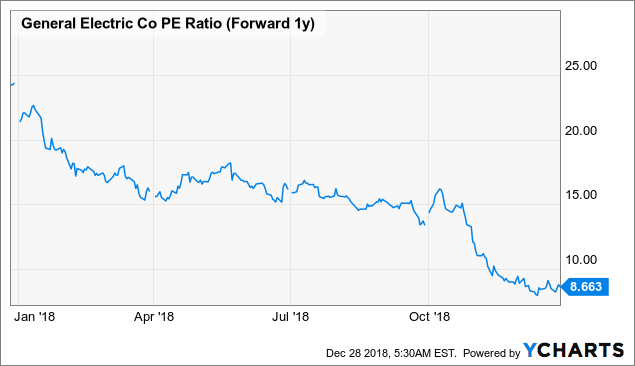 Earnings estimates for 2019 are still way too elevated. Stock market targets for 2019 are also too high. The Federal Reserve is still targeting higher rates and continued balance sheet reductions. The effect of the tax cut legislation will disappear and year-over-year comparisons revert back to normalized growth rates. Economic growth is set to slow markedly next year. There are a lot of things that have to go “right” to get the “bull market” back on track. But there is a whole lot more which is currently going wrong. After having sold a big chunk of our equity holdings throughout the year, and having been a steady buyer of bonds (despite consistent calls for higher rates), my “Christmas Wish” is for one last oversold rally to “sell” into. 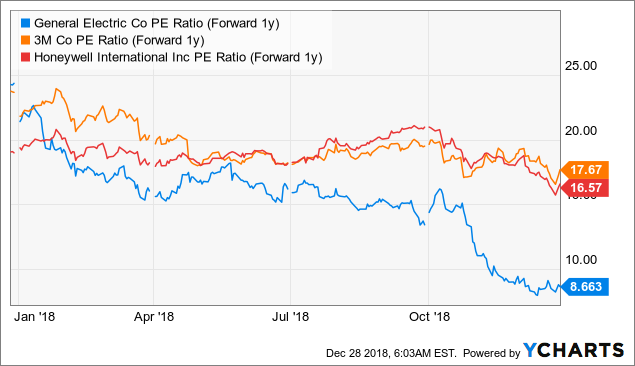 The most likely outcome for 2019 is higher volatility, lower returns, and a still greatly under-appreciated risk to capital. But, for the bulls, it’s now or never to make a final stand. Just remember, getting back to even is not the same as growing wealth. Every year, my inbox fills up with holiday gift guides, predicted buying trends, and everyone’s list of the “best of the best” stocking stuffers. I even follow suit at times, and create my own gift guides to help consumers navigate the ever-changing tech options… But this year, if there was an award for holiday gift guides, Digital Trends would be winning big, because their genius holiday campaign has everything and then some. The guide Digital Trends put out depicts products featured and told as stories in miniature scenes, thanks to a partnership with animation studio HouseSpecial. The stories and scenes offer gift ideas for the tech savvy, but in several different categories, like audiophile and foodie. Each scene holds tremendous attention to detail, and draws in the attention of the viewer for several different reasons. Not only are the scenes visually appealing, they are perfectly targeted, and feature products without the products being the actual focus of the scene. MediaPost pointed out that the figures for the guide were designed in H0 scale. This is the traditional scale for model railroads (Hello Christmas trains and villages! ), and this time of year, that is a genius touch, that proves 1) size matters, and 2) attention to detail on every level feels luxurious because we rarely see or experience that in advertising. It’s not only WHAT they are saying about the product(s) but HOW they are saying it that has determined the efficacy of their guide. This guide is intentional. It’s clear that the creators went in with a strategy, with intentions, and with clearly defined tangibles as outcomes. This is important because it’s so much easier to get it right when you have the what, how, who, and where answered before you begin. It’s visually impactful and easily shared. The scenes are done so well, they have feelings to them of nostalgia and something unique, and they are easily shareable, which allows consumers to easily create buzz for them. They are tapping into the nod to collectable holiday villages and model railroads, hitting right to the type of consumers they want to attract. They feature products without being product shots and really separate out and make products that are me-too, and available anywhere, special enough to be clicked and bought to reward the creativity. Point blank: the guide makes people want to buy items they may have scrolled past on Amazon more than once, because of the emotion and connection they feel to the scenes and campaign. With more than 30 million unique monthly visitors, I’m happy to take notes from Digital Trends. Alana Wolfman, their director of production, who shared their strategy of using SEO search queries to stay in front of exactly what users are searching for during the holiday season. In addition to that, the scenes themselves were created by a team that has worked on campaigns for major players like Chipotle, Planters, noosa, and Dish Network. The reason I really love this campaign, other than the adorable perfectly executed miniature displays, besides the fact that it is everything an advertising campaign should be in its ability to be shared and to capture attention, aside from it’s near perfect timing and magnificent attention to detail… is how the creators went outside of the box, to create something unique. That might not sound like much, but to be unique with intention, in a place where everyone is trying everything to be relevant, is a big deal. The thought put into creation speaks for itself, and should push your goals for future product advertising. Don’t be afraid to be unique, to go big (or small! ), and to pay so much attention to the details that your attention feels like luxury to the consumers experiencing your campaign. To keep a business running smoothly, managers need to train their employees on how to perform pre-prescribed duties on a consistent basis. It’s also every leader’s responsibility to hold their team accountable to a high standard of quality and to work with them on streamlining their processes to increase efficiency. A big challenge, however, is in preparing teams to excel when circumstances take an unexpected turn. Uncertainty is a given in business interactions, whether with clients, partners or colleagues, and leaders must take steps to coach their employees on best practices for handling uncommon situations well. At my company Amerisleep, we encourage our staff to approach unfamiliar problems with an inquisitive mind. Rather than get flustered by the introduction of new variables, our team members are expected to ask questions to identify the key issue, diagnose the cause, and research the best solution. Below are three things other leaders can do to ensure their team is comfortable dealing with uncertainty — and that they are capable of thriving too. 1. Create contingency plans teams can use to guide next steps. When you anticipate the possibility of alternative scenarios, you can pre-plan different ways to respond. In sales, for instance, one of the most dependable strategies is creating a script that features curated response patterns a salesperson can use to guide conversations based on each client’s reaction. This reduces the negative impact of resistance and rejections because it gives the salesperson a model for how they can best overcome the situation. When negotiating with vendors, too, you may encounter obstacles that could derail the deal. To prepare our managers for those situations, we walk them through the most common sticking points such as price and timeline. If the costs are too high, we seek ways to cut back on expected deliverables to decrease the overall scope and rework the engagement so that it fits our budget. If the delivery schedule is longer than expected, we dissect the process to discover which steps we can expedite. As a regular part of the training process, department leaders should provide their team members with guidance for how they should process uncertainty and proceed with a solutions-based approach. 2. Train staff to identify elements under their control and act accordingly. The unknown can be quite jarring for some people. It often causes those unprepared to abandon all hope of influencing the situation and to accept whatever happens. But participants always have some measure of control, even when the expected outcomes seem less likely to manifest. Teach your employees to look for elements they can leverage — such as historical data, rapport with other team members or participants, and available tools and technology — to allow them to reestablish their composure. Otherwise, they may view new variables as an obstacle instead of an opportunity. This will also help them become more self-reliant, empowering them to independently push more projects through to completion. Our employees at Amerisleep take this to heart. When website outages occur, rather than panic, our development team follows a pre-defined process for troubleshooting and resolving the issue. Additionally, they take this opportunity to identify ways to further strengthen the reliability of our online experience, mitigating the risk of future failures. Although it’s impossible for us to predict when our site may experience a bit of downtime, what’s certain is the fact that our engineers are both skilled and process-oriented enough to find the perfect solution in a timely manner. 3. Promote strong analytical and critical thinking skills. When unforeseen circumstances disrupt a plan, it’s common for people to immediately begin thinking about the ramifications of the uncertainty on their future. In these instances, they’re focusing too heavily on the consequences when they should exert more energy finding meaningful solutions. Those who excel at dealing with the unknown stay in the moment and follow a successful roadmap: prepare as much as possible beforehand; anticipate the unexpected; look for ways to make a difference; and act decisively. By taking a structured and strategic approach to addressing unfamiliar scenarios, you maintain your ability to think through the problem rationally rather than reacting emotionally. The entire financial system that everyone, including all businesses, depends on sits on the need for trust. And in a couple eof tweets, the Treasury Department and Treasury Secretary Steven Mnuchin may have shaken that trust loose. The Treasury Department said that Mnuchin held a series of calls with CEOs of major banks: Bank of America, Citi, Goldman Sachs, JP Morgan Chase, Morgan Stanley, and Wells Fargo. The CEOs confirmed that they have ample liquidity available for lending to consumer, business markets, and all other market operations. He also confirmed that they have not experienced any clearance or margin issues and that the markets continue to function properly. Equity markets have been rocky for various reasons, including tariff wars, general uncertainty, and the Fed increasing interest rates. No markets rise forever and we’ve seen a long run. A recent survey of global CEOs showed that chief financial officers overwhelmingly expect a recession by 2010 and many think 2019 will be the year. In turbulent times, there are tremendous reasons for businesses to be wary and for governments to be concerned about basic banking issues like liquidity. Without enough money available, institutions can’t lend money and an economy can grind to a halt. Mnuchin’s move might have made sense if there were public concerns about bank stability. Bank stocks have been taking a hit with market oscillations. When people worry about the economy, they expect that banks may suffer. When things slow, fewer people and companies take out the loans that are the source of institutional income. But there hasn’t been a lot of concern about underlying bank stability. At least, there wasn’t until Sunday evening when the tweets hit the fan. Particularly as Mnuchin was reportedly on vacation in Mexico. While apparently intended to as a pre-emptive reassurance to investors, the tweet may have done just the opposite, stoking fears that the government is bracing for the worst. MarketWatch then copied a number of investor tweets. Here’s one. It may be that all is well. But markets react to expectation and emotion and things have been shaken already. You now much reexamine your strategy in the wake of decreasing confidence in the economy and keep a close eye on new statements that could further shake things up.